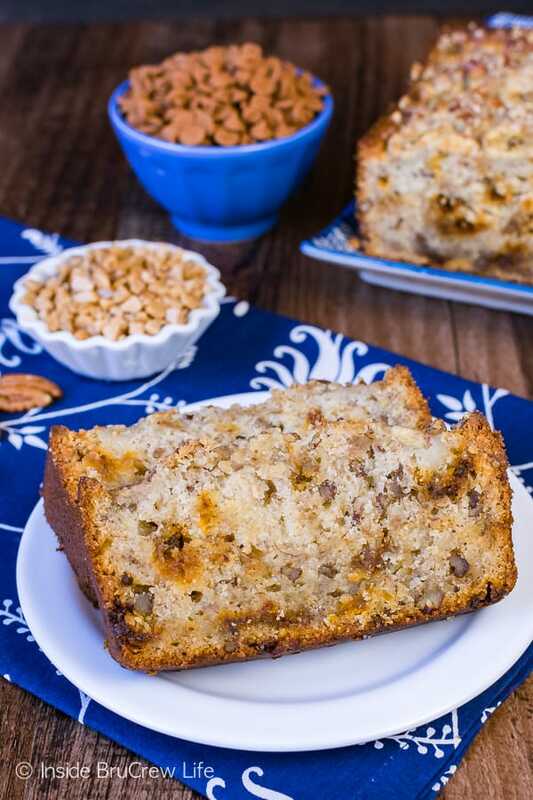 A loaf of this Cinnamon Toffee Pecan Banana Bread is a delicious addition to your morning routine. 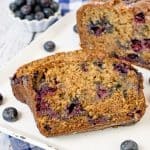 Enjoy a slice with your coffee or milk for breakfast or for your afternoon snack. I went from buying bananas all the time to hardly buying them at all now. I’m not really sure what happened. Usually every time we did some grocery shopping, I would grab a bunch of bananas for our fruit bin. Oh, wait! I do know what happened. Our oldest son went to college a few months ago, and without him around the bananas just sit there all lonely like. He was usually the only one who would eat the fresh bananas I would buy. We had a good system going on. I would eat the green bananas, then he would eat the ripe bananas. Anything that turned brown was then fair game for making banana pancakes or the best banana cake. 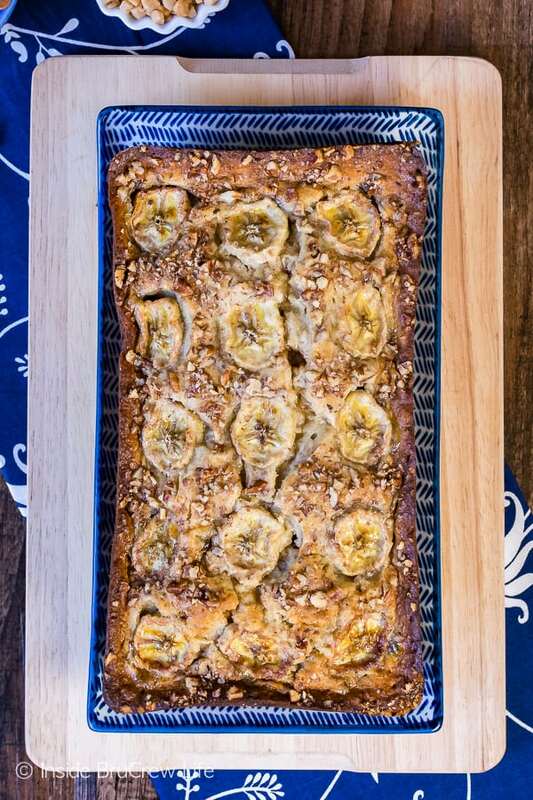 I do really love baking with bananas. It’s probably one of my favorite ingredients to use. Of course, nothing will ever top chocolate and peanut butter. In just one day, our oldest will be home from college to spend Thanksgiving with us. I am so excited! Only one more sleep until he gets here. I think that means I need to do some grocery shopping today because that boy is going to need some good home-cooked food. And some bananas, of course. His college doesn’t have a cafeteria like what I remember in college. They have a food court with a bunch of different fast food restaurants. He said that after a few weeks of eating fast food, he was definitely over it. I’m pretty sure he is looking forward to regular meals for a few days. Hmmmm, after talking to him about food, I’m getting the feeling he is missing dinner and his puppy more than us. A few weeks ago, I did actually grab a bunch of yellow bananas while we were grocery shopping. Of course, like I said, no one else eats them, so they turned into a bunch of brown bananas pretty quickly. I have noticed that bananas turn brown a lot quicker here. It must be the Florida humidity. That meant a loaf of banana bread was in our very near future. 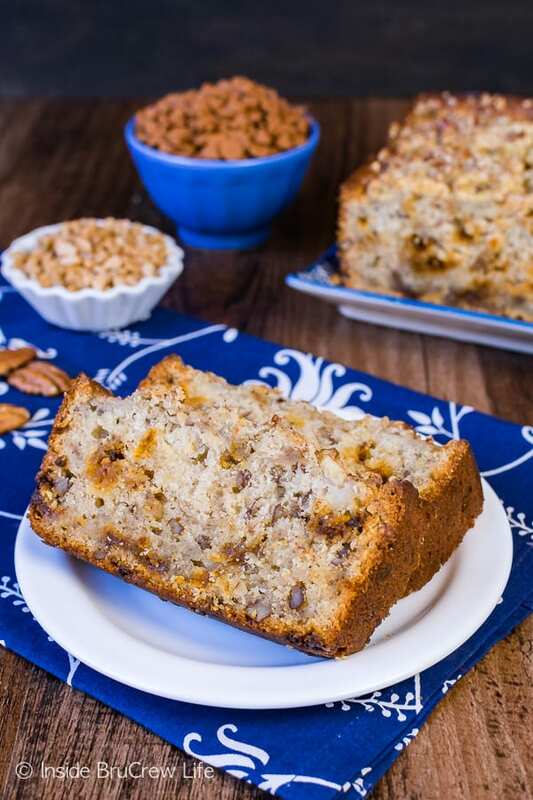 I decided to give this almond joy banana bread a fall twist. 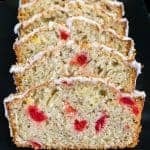 By just changing out the extra mix-ins you can totally change the flavor and taste of banana bread. 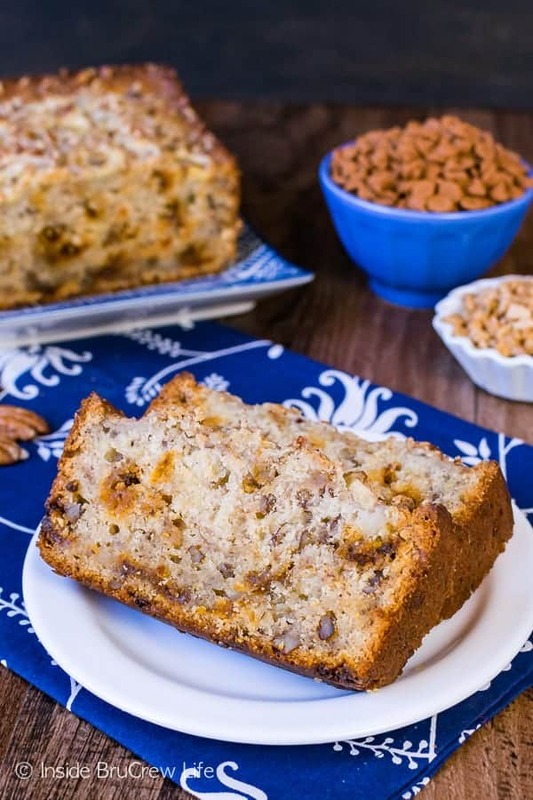 The toffee bits, pecans, and cinnamon chips were the perfect compliment to this sweet bread. 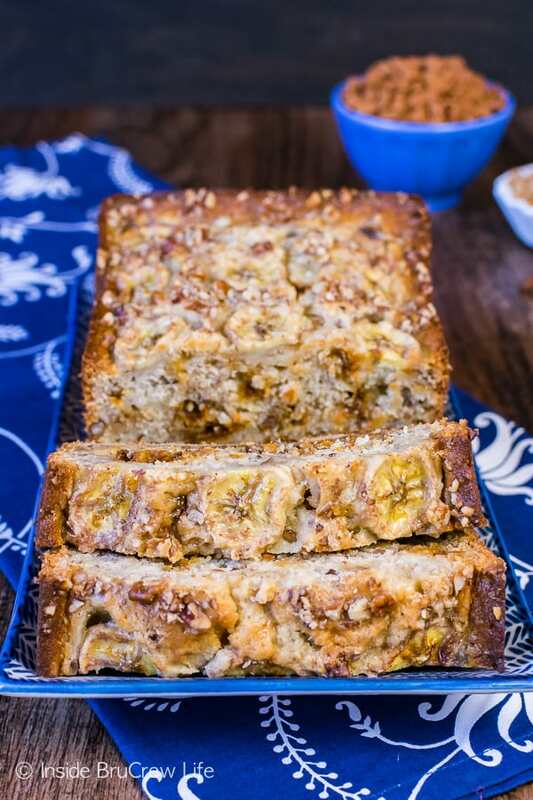 A few extra banana slices added to the top of this cinnamon toffee pecan banana bread gave it such a pretty look too. After one bite of this bread, I was in love. There is something so comforting about a loaf of banana bread. I can’t really explain what or why. It just makes me happy. 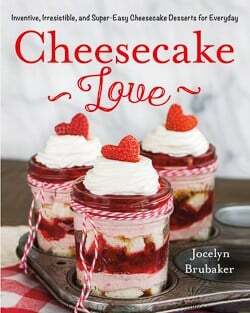 Today I’m getting ready to bake some more fun banana inspired recipes to welcome home my baby boy. That will definitely send me to my happy place today too. Can’t wait to squeeze his guts tomorrow! 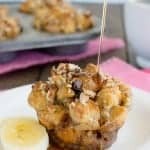 If you are looking for more ways to use up ripe bananas, you need to check out a few of these recipes that I found. 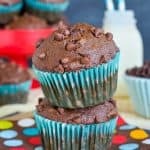 I can’t wait to stock my freezer with a batch of these two ingredient banana chocolate chip ice cream bites. Such a fun and easy snack idea! Add a box of cookies or sweet crackers and this banana pudding dip is sure to disappear in a hurry! 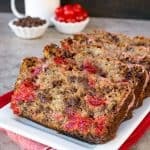 And of course, anything with the words banana split has my attention, so I love this banana split poke cake! It looks amazing!!! 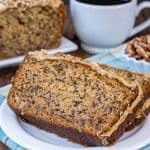 A loaf of this Cinnamon Toffee Pecan Banana Bread is a delicious addition to your breakfast routine. Enjoy a slice with your coffee or milk. Preheat the oven to 350 degrees. Spray two 9x5 loaf pans with nonstick spray. Beat the butter, cream cheese, and sugars until creamy. Add the mashed banana, eggs, and vanilla and beat again. Stir together the baking powder, baking soda, salt, and flour and slowly add it to the banana mixture until completely mixed in. Stir in the cinnamon chips, toffee bits, and 3/4 cup chopped pecans gently. Divide the mixture evenly into the prepared pans. Add the sliced bananas to the top of the batter and sprinkle the remaining pecan bits around the slices. Bake for 70-75 minutes or until a toothpick inserted into the center of the bread comes out mostly clean. A few crumbs sticking to it is good. Remove and let cool in the pan for 15 minutes, then place a plate on the top and flip it over and out. Turn the bread around so the banana slices are facing upward. Serve warm or let it cool completely before covering. Makes 2 loaves of bread.